Both players can see each other, but they exist in their own instances of the same level, and appear as a ghost to one another. You can see what your opponent is wearing, and even their actions at any given time, but it won’t correlate with your own targets, crowds, and events, as they’ll be reacting to a different situation. For a kill to count towards your score it has to go unnoticed. This leads to a panicked game of cat and mouse as you locate and then follow each assigned target, waiting for them to move through an unpopulated area of the map before you strike, all the while knowing that your opponent may have engineered a situation that will land them the point quicker. And once you execute your target, there’s a 20-second countdown timer to sit out before you get the point – if some hapless innocent walks in on you, it’s all over. And if you accidentally – or, indeed, purposely – execute any non-targets, you’ll lose a point, too. It’s brilliant, stressful stuff. To aid your killing spree, there are ghost crates dotted about the level that supply you with random items. Unlike targets – where two separate opportunities exist – crates exist in both realities, and their contents are shared between players. As such, if you take something from a crate you deny the other player the opportunity to use that weapon or disguise. PCGamesN: Ghost mode is a fascinating change of pace. Travis Barbour: It’s part of a bigger ambition that we have to introduce new ways to play Hitman. 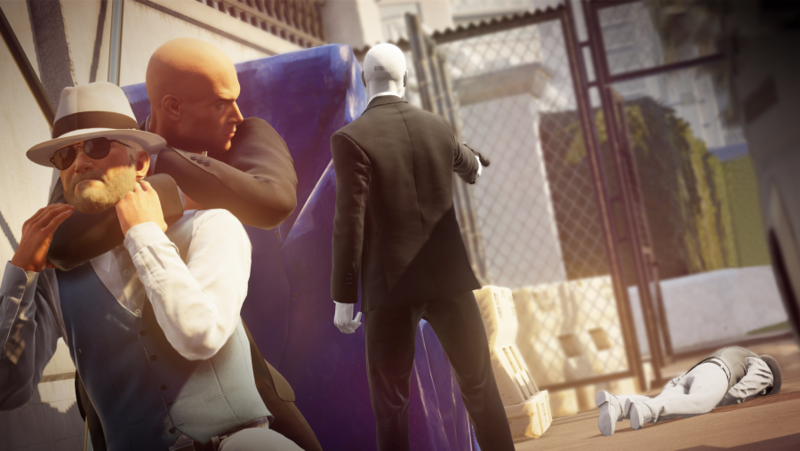 We have the single-player mode that was adored generally – what Hitman does is unique. 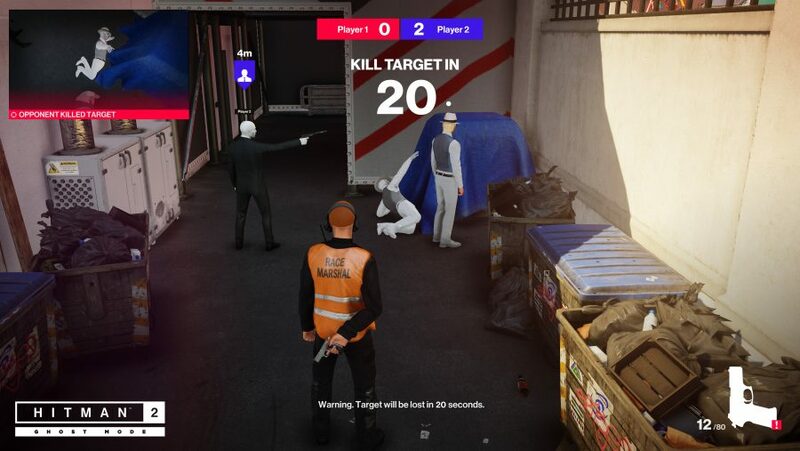 Then we had the online sniper missions with Sniper Assassin, which is actually a game mode in itself, and there will be more maps for that in Hitman 2 – it’s not just a stand alone pre-order thing, it’ll be in the game from the get-go. Then Ghost mode allows us to go a little more competitive. We saw a strong speedrunning community in season one – that was part of the inspiration. Obviously multiplayer is a cool thing. 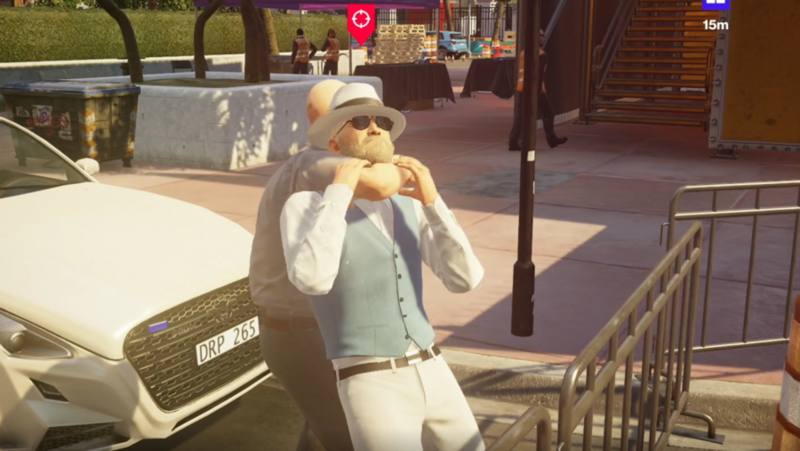 We wanted to try and see how that would work for Hitman. 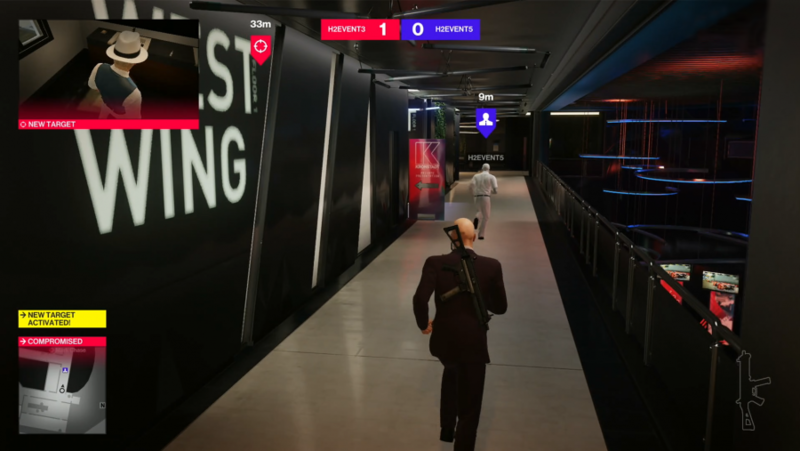 We didn’t just want to add multiplayer into Hitman, but do Hitman multiplayer. There’s a big difference for us that it feels like Hitman with a competitive edge. You still play the game as you normally would, just you want to do it a little bit quicker. But not necessarily – if you want to play a little bit slower you can, it just depends who you’re up against. We use the analogy of having a buffet: we have the single-player campaign, we have the online co-op missions, and now we have a competitive multiplayer mode as well. So we’re providing lots of different ways to play Hitman – some people might like more than others, some people might like all of them. It’s also based on the Escalation Contracts that we had in the previous game, where things get progressively harder and more difficult. That theme is also in Ghost mode, where the longer you go the higher the risk that you’ll get spotted or caught. You can’t reset your combat state, so if people are searching for you and you’ve run out of disguises that can be used, it gets increasingly more difficult. If you’re a pro player that might not happen, but for most people the tension ramps up. I think the combination of all those things is what led us towards having Ghost mode. What does high-level play in this mode look like? When you play against someone who is kind of the same level as you, and is good on their general Hitman knowledge or map knowledge, the games get really, really tense. We’ve seen some matches in the office that finished 5-4. And we had one insane match that was 4-2, and then it flipped so that the other guy won 5-3. When high-level players are competing it’s really polished and very cool to watch, but even if you’re brand new to the mode it only takes two or three matches, I think, before you fully understand what Ghost mode is. You start to realise how things can be useful, so you’re never too far away from that next level of understanding, and that next layer of depth. It’s not as unapproachable as some multiplayer modes can be because you are by and large responsible for what you do – it’s just about doing it that little bit quicker, and the stakes can rise as you see what your opponent does. Another cool thing that it adds is that it can go in any direction depending on the items you get in the crates, what your opponent gets, and whatever items they throw into your reality. There’s a dynamism there that single-player doesn’t necessarily have. Was there ever a point in development where you considered having players compete in the same reality? No – we ruled that out quite quickly because it just wouldn’t work. It’d be unfair if one person just starts shooting and you’ve got to deal with chaos in the whole level. We thought it’s more interesting that you’re kind of responsible for your own reality, as we call it, even though there’s crossover. Can you tell me more about Ghost items? Ghost items interact between both realities: I can throw a coin and my target reacts to it, but your target would react to it as well. But If I’m the first one to eliminate the target, then that 20 second countdown starts for me – my target’s dead, so if I then chuck the coin your target will start moving somewhere you potentially don’t want him to be. What other Ghost items will there be? Right now we only have the coin. The mode is in beta so these decisions are still being made – whether there will be two types of coins, whether there will be other ghost items. Those really, really small details are still being decided, but we’re thinking of some cool ideas for what other Ghost things there could be. It’s very exciting. The ghost crates crate a really interesting dynamic. Yes! 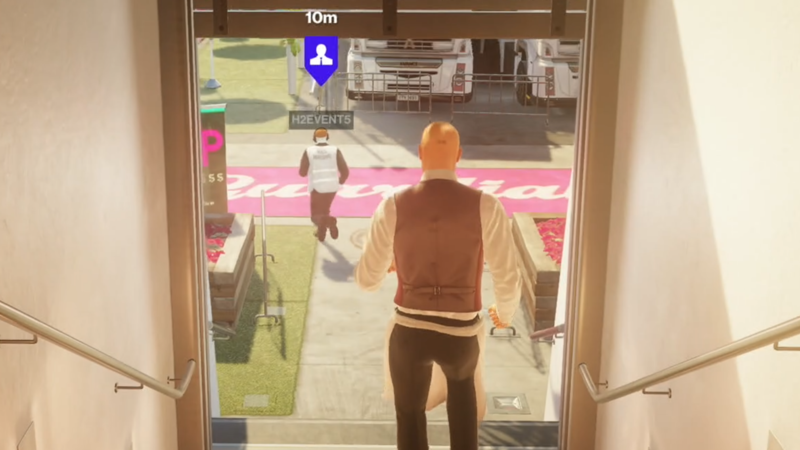 The single-player for most Hitman games is often about planning and preparation. Whereas, in Ghost mode, as you start with no items you rely on either getting up close and personal with all your targets, picking up items that you find on the way, or the useful items in the Ghost Crates. But it adds this strange element where you open a crate, and there’s a disguise you can pick up, and you kind of have to mentally map out whether that’s a good choice for you. You might take a disguise that’s good for one target, but then when the new target appears you’re trespassing in that disguise and you have to find another disguise that’s somewhere else, or find another Ghost Crate. There’s a huge amount of depth in the mode that doesn’t really become apparent until you’ve played it a few more times. We’ve obviously played it a lot, and we’ve had tournaments where people are screaming and shouting. I had one moment where we were 4-4, and we both took the target down in the last second, so we were waiting for the final results screen to see who won. I saw it flash up that I had the five and I jumped out of my seat, and the guy opposite me was like, ‘Come on!’. The more you play it, the more strategies surface. Sometimes you might be in control, and other times you open a crate and there’s just one item left, and you’re like, ‘Ok, how can I use a golf club in this situation?’.